In 2009, Latin America was sucked into the financial crisis which, following the bankruptcy of Lehman Brothers, echoed around the globe and shook and shocked the entire global financial system. As a consequence, Latin America experienced a slump in real GDP growth, a drop in exports and a collapse in inward FDI flows. 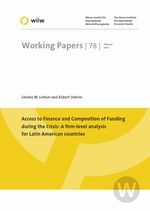 Against that backdrop, the paper sheds light on the effects the global financial crisis had on firms’ access to financing as well as on their funding strategies of investment projects. The analysis uses data collected as part of the World Bank Enterprise Survey (WBES) component of the Latin American and Caribbean (LAC) Enterprise Surveys 2006 and 2010 and demonstrates that during the crisis, the availability of internal capital markets played a pivotal role for larger and foreign firms or firms that were part of a larger firm; in contrast, no evidence is found that state-owned firms enjoyed preferential treatment or special budgetary support. In addition, it shows that in the face of the crisis, entrepreneurs adapted their funding strategies: firms whose access to financing deteriorated, more intensely relied on bank and supply-chain-financing, foreign firms or firms that were part of a group more strongly availed of internal funds, while firms that both export and import more intensely drew on bank credits to fund their investment projects.